Here's a story I missed while at CES last week. According to the press release these 2 screen modules are based on screen tech which JDI has been working on since at least late 2012. 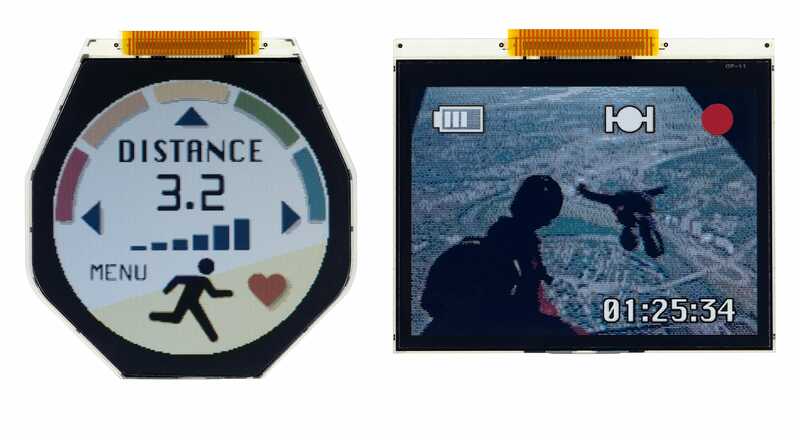 They are reflective (no backlight) LCD displays which are designed to consume very little power, thus making them suitable for ultra-low power applications like smartwatches. These screens also feature a unique low-power trick: each pixel contains a small amount of sRAM. This enables the screen to maintain an image on the screen without constantly having to refresh it. This tech first appeared in late 2012 when JDI showed off a 7" prototype. I had been hoping that we might see that screen integrated into a tablet, but so far as I know that hasn't happened. Instead JDI turned to producing a much less capable version of the screen for the wearables market. The screen units shown above are only capable of displaying 64 colors, and not the thousands or millions of colors you might expect in a regular LCD screen. The round screen measures .99" and has a resolution of 180 pixels, while the rectangular screen measures 1.39" with a resolution of 205 × 148. They are in mass-production now, and with luck could show up in mobile devices later this year. Their characteristics could also be interesting for ereaders but none on screen color backlit got the win for now.